Stainles Steel 430 Seamless & Welded Pipe, SS UNS S43000 Pipes, Stainless Steel 430 Tubing, ASTM A268 Stainless Steel TP430 Seamless Tubing, ASTM A268 430 Welded Tubes, TP430 Stainless Steel Seamless Pipe, SS Werkstoff nr. 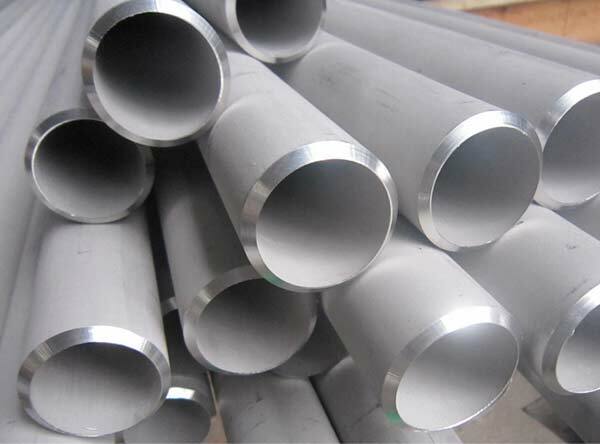 1.4016 Welded Pipes, Stainless Steel TP430 EFW Pipes, Manufacturer, Exporter, Suppliers, Mumbai, India. As an acclaimed endeavor of the business, Calico Metal are included in offering an unfathomable exhibit of Stainless Steel 430 Pipes and Tubes as a producer, exporter, stockiest and supplier to our residential and worldwide clients. As driving maker and exporter of 430 Stainless Steel Pipes and Tubes (too known as WNR 1.4550/1.4961 Pipes and Tubes), we have been extended our business sector system all through the world so that our items have been come to in the abroad commercial center. 430 Stainless Steel is variant of the basic austenitic 18/8 Grade 304 with added Columbium - the introduction of Columbium stabilizes the steel and eliminates carbide precipitation which subsequently causes intergranular corrosion. The steel has excellent forming and welding qualities and excellent toughness even at cryogenic temperatures. Stainless Steel 430 is a ferritic, straight chromium, non-hardenable evaluation, joining great consumption resistance and form ability qualities with valuable mechanical properties. Its capacity to oppose nitric corrosive assault allows its utilization in particular compound applications yet car trim and apparatus segments speaks to its biggest fields of use. Grade 430F is the free-machining variant of this evaluation, accessible in bar structure for utilization in programmed screw machines. Grade 434 is the molybdenum bearing rendition of Grade 430 and has the same valuable blend of properties. Its molybdenum expansion enhances consumption resistance. Stainless Steelproperties for 430 are determined for level moved item (plate, sheet and curl) in ASTM A240/A240M. Comparable yet not so much indistinguishable properties are determined for different items, for example, forgings and bar in their separate determinations. Properties of Grade 430F are indicated for bar in ASTM A582.